Carnival games look fun, and they usually look easy. This summer, I brought the kids to the shores of the Pacific Ocean, where they visited the Santa Cruz Boardwalk. We rode rides, ate ice cream and avoided carnival games. 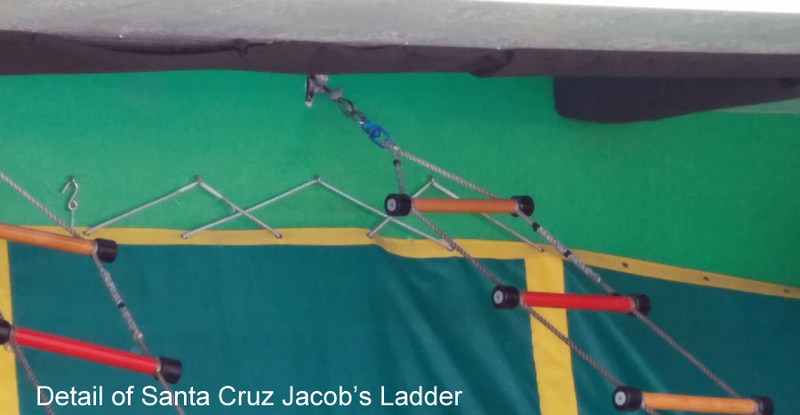 The most appealing game was called "Jacob's Ladder", a rope ladder anchored to a wall, positioned above an cushion. The rope ladder is fairly short, and it offers the most outrageous prizes in the park. Giant stuffed bears and life-size Minions. The prizes are big because the rope ladder is extraordinarily difficult to master. The ladder is suspended by two centered swivels, which makes it remarkably unstable. Most kids that try to climb the ladder end up spinning over to the side and landing on their back against the vinyl cushion below. 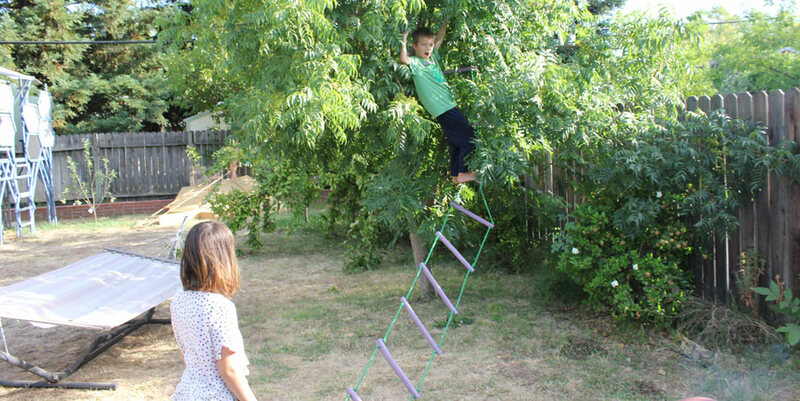 Trying a ladder like this looked impossible without some practice, so I refused my kids' request to try it, telling them I'd build them one at home instead. And I actually did. 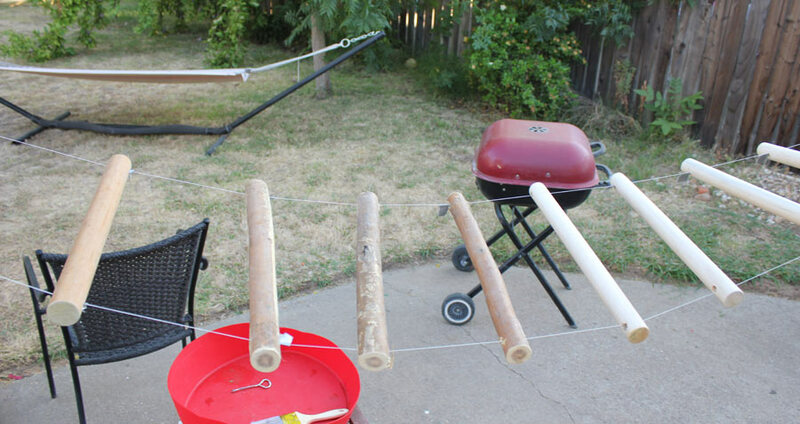 One sturdy tree had a suitable horizontal branch, so I bought 100' of sisal rope and three four-foot 1¼" wooden dowels. 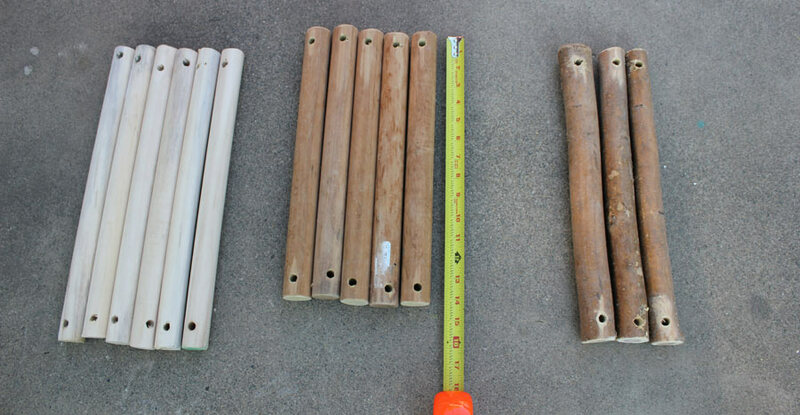 I cut the dowels into thirds, which gave me nine 16" ladder rungs. I decided to leave the rope in one continuous piece, so I had to tie my knots at precise intervals, leaving exactly 16" between ladder rungs. Getting knots to settle at precise locations is a little tricky, but I knew if they weren't right on, my ladder would end up looking like a fun house instead of a carnival game. 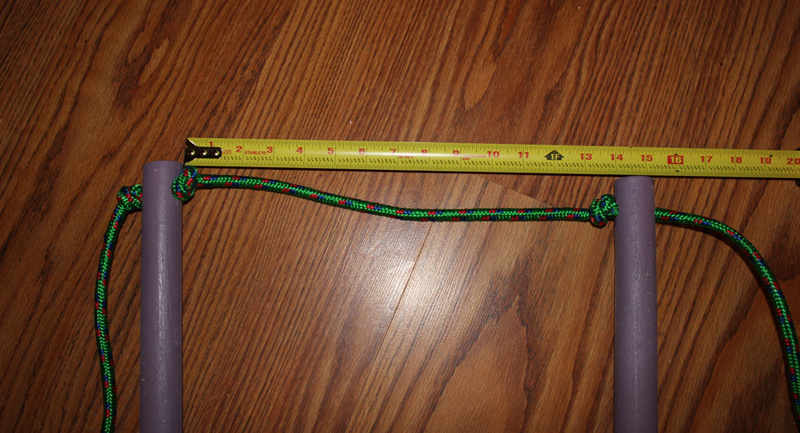 I couldn't find a large swivel for the top connection, so I settled on a knotted loop of rope. It worked perfectly! To mimic the carnival challenge, the ladder should have been anchored at a single point at the top and the bottom. Before I set that up, I used a two-point anchor by pinning the lowest rung to the ground with long spikes. This made it easier for my kids to learn how to climb the ladder. I'll re-engineer the bottom later to increase the difficulty. Here's a look at the final result. OK, so I kind of forgot to mention that you'll need $300 worth of 6" foam rubber padding to prevent your kids from killing themselves on this thing. They flip over constantly and always have an uncontrolled landing. I admit, falling off of this thing is pretty fun. The raw foam isn't ideal either. 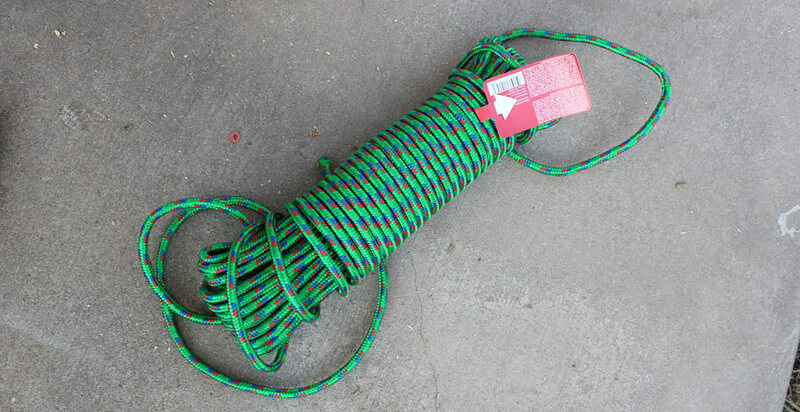 It has a tendency to grab, and could probably break your leg if you fall sideways against the rope with one foot sunk into the foam. It would be better to cover the foam in marine vinyl. Maybe an aero bed would work, but it's going to look even more trashy than this mountain of foam. The kids really liked the Jacob's ladder, and their balance and climbing technique steadily improved! 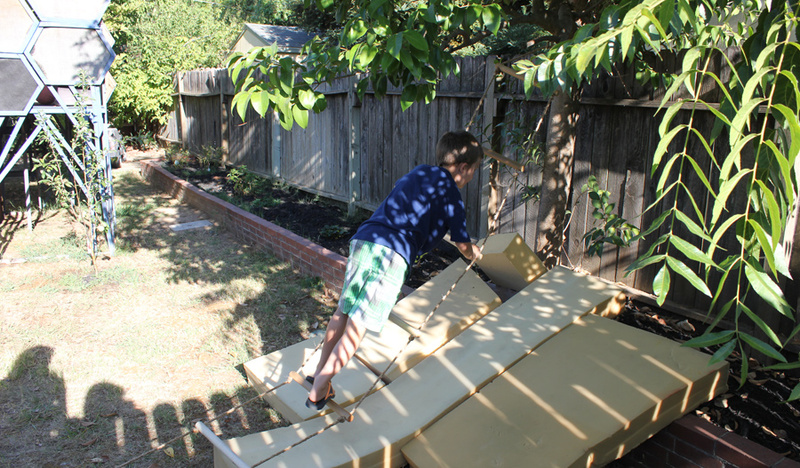 There is almost nothing as nice as seeing your kids take on a challenge and slowly make improvements to eventually defeat it. 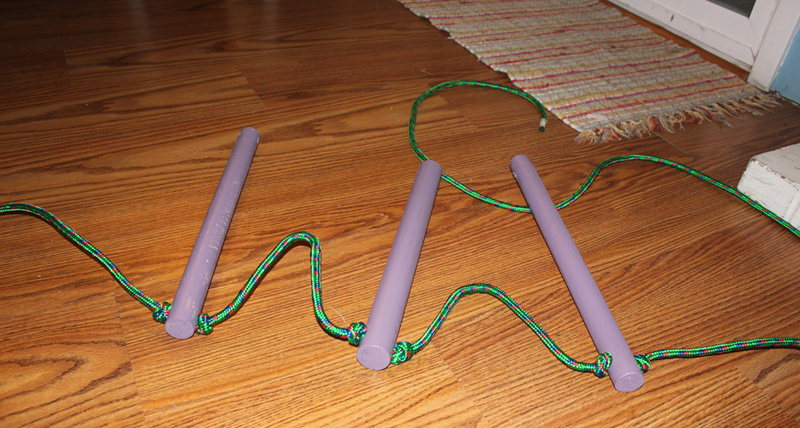 Determined to duplicate the success of the rope ladder, I ran out a few days later and bought more rope and dowels. I also had some dry wood from tree branches, so I used them as well, cutting to 16", 15" and 14" lengths. 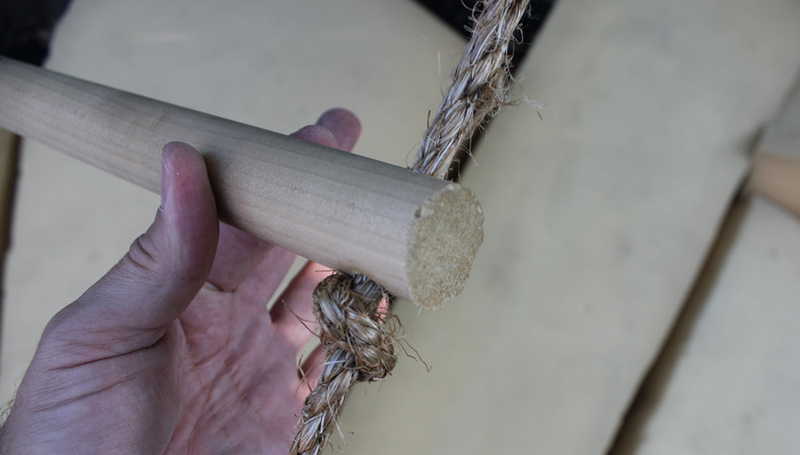 The sisal rope seemed succeptable to weather, so I used a synthetic rope for the next ladder. 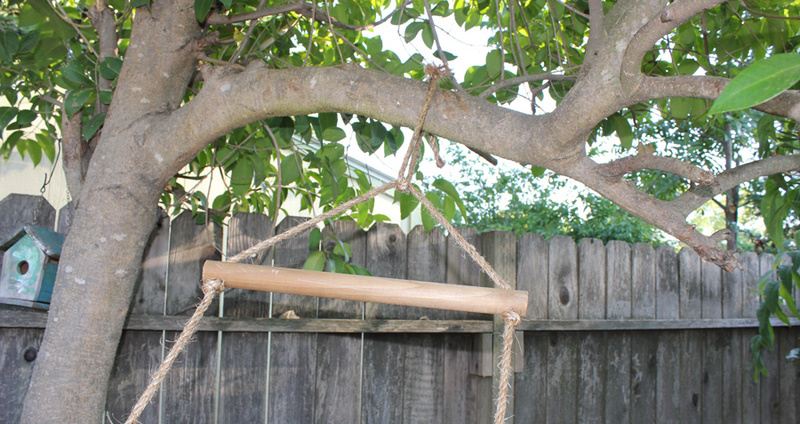 This time I decided to span two trees, and to create an overhead hand-over-hand rope ladder. I decided to paint the dowels this time, to help preserve them. I used string to hang them for painting. 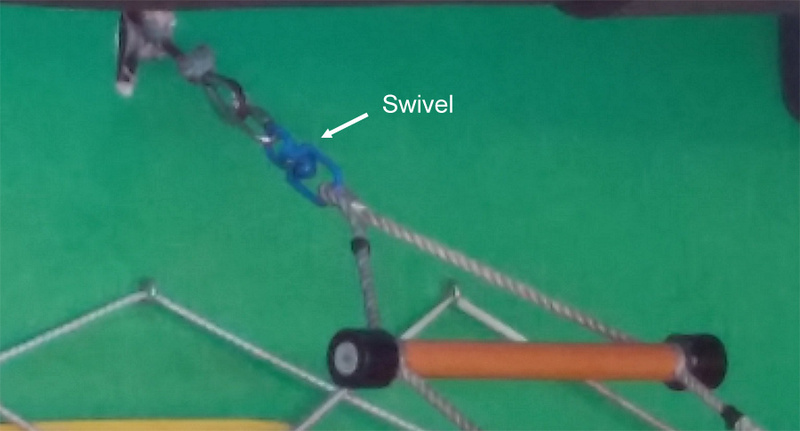 To keep the rungs from moving around, I used a two-knot technique on the ropes. I really needed to keep the rungs steady and equidistant. The second rope ladder didn't work out the way I expected. 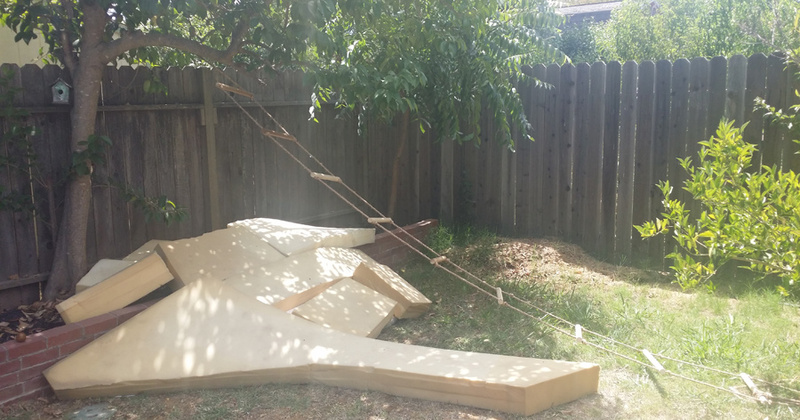 My plan was to create an overhand rope ladder bridge between two trees in the backyard, at a height of about seven or eight feet, so the kids could move hand-over-hand across to another tree. Unfortunately, the plan was a bust. The trees, while tall, were not rigid enough to resist bending when weight was added to the rope ladder. Both trees bent a little, resulting in a sagging rope and a sad experience for my kids. This was a disaster. I didn't have any trees which were mature enough to bear the lateral load of a kid! So I adjusted my plan. 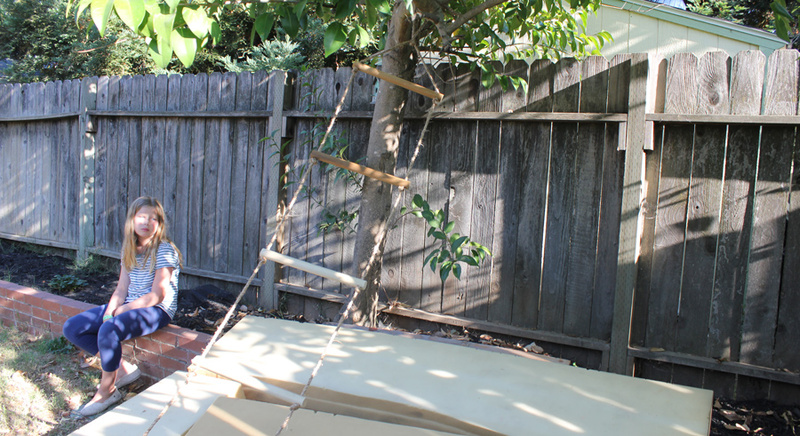 Instead of a horizontal ladder, I cut the ladder in two and constructed two vertical rope ladders which led up into one of the taller trees in the backyard. 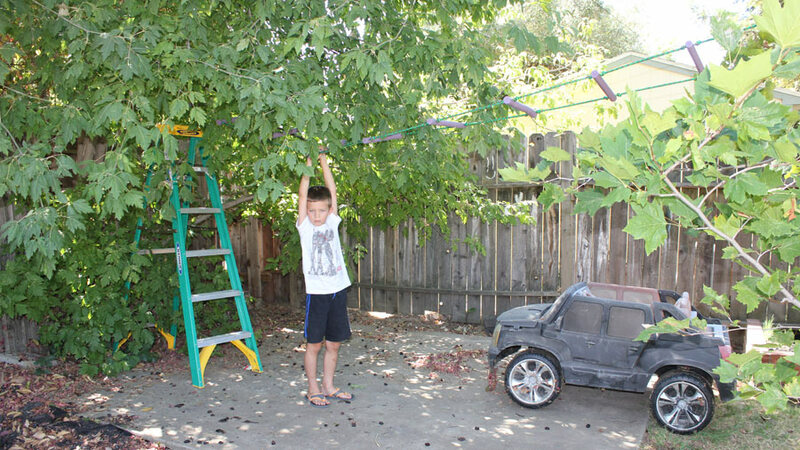 It seemed silly to have two ladders into the same tree, but in practice, the only time the kids want to climb a tree is when someone else is already up in the branches. I'm not planning to leave all the fun to the kids. I'm also going to train on the Jacob's ladder. Hopefully we'll have a leg up next summer at the Santa Cruz Boardwalk!